Today, most UPS, aircraft, telecoms and other critical application batteries are of the lead-acid chemistry. The unfortunate truth about most of these batteries is that you will never know their true capacity until you actually perform a full capacity test. In order to correctly determine the capacity of a given lead-acid battery, the battery must first be fully recharged before being allowed to 'cool down' for several hours. Once cool, the battery must be discharged at the manufacturer's determined rate, down to a set end voltage. For example, a 12 V 100 Ah battery could be discharged at 10 A for 10 hours down to 1,85 V per cell. If the battery is able to sustain the 10 A discharge for 10 hours then it has 100 A hours of capacity at the C/10 rate, where C is the capacity of the battery. However, if the same battery can only sustain the 10 A discharge for say 5 hours, then the battery only has approximately 50% capacity left. One of the most advantageous features of lead-acid batteries with pure lead-tin alloy (from suppliers such as NorthStar and Hawker SBS) as opposed to the cheaper and lower performance lead-calcium is that their state of charge (SOC) can be estimated simply by measuring their open-circuit voltage, since the open-circuit voltage is a direct function of the concentration of electrolyte within the battery - even though the battery might be dry. As the concentration of electrolyte decreases so too does the % SOC. For NorthStar batteries, the relationship can be linearly approximated by the following equation: % SOC @ C/20 = OCV x 62,5-712,5 where C is the capacity of the battery in question. 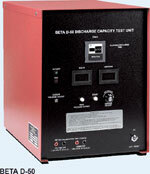 Aztec Electronics stocks a wide range of lead-acid (and NiCad) battery analysers/dischargers. Aztec's Beta D-50 analyser is suitable for 12 V and 24 V batteries and can be adjusted for constant current discharges between 0 and 50 A. The end-point voltage and test time can be set prior to discharging. Once complete, the digital display will show elapsed time, voltage and current and a green lamp will illuminate when the battery capacity is above the preset requirement. Alternatively, a red lamp will illuminate if the battery fails to meet preset limits.